So I love my 2011 E550 (W212). It was the last year of the M273 V8, so it has been bullet proof reliable and very fun to drive with 382HP. However, I have always hated the warping of the front rotors. These were changed under warranty pretty much every 4 months. I then upgraded to better aftermarket rotors from StopTech as well as ceramic pads. This lasted much longer than stock units, but are now also warped and need to be replaced. So here is my question: Obviously there are several posts regarding Brembo "Big" Brake upgrades, as well as the AMG brakes from the E63. However, when I was researching the E63 brake upgrade, I noticed that the part number for the front rotors was the same as the 2009-2010 CL63. 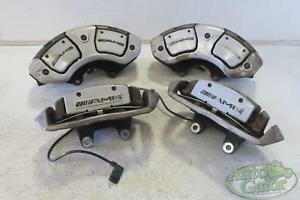 So I started thinking, can I fit CL63 front calipers on my E550? The CL63 calipers are the floating style with twin pistons and uses 4 brake pads per side. Obviously designed to stop a very heavy car. Has anyone out there ever heard of this conversion? Is it possible? Right now, I'm only focused on the front. 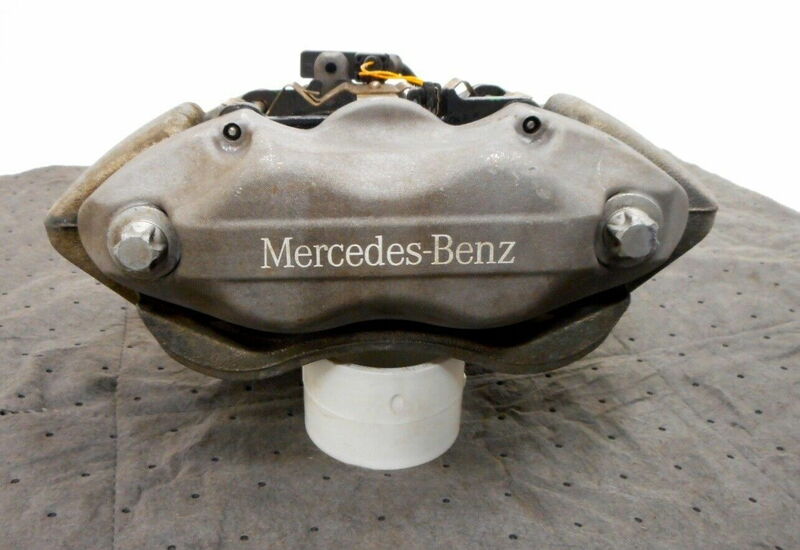 Since my car is a 4Matic, I'm thinking the rear calipers might not work.Any thoughts on this would be appreciated. Might cost more than its worth in all honesty. Very expensive mod. ROI isn't that great unless you just like the look...but performance wise, not so much. As far as I know the brake calipers on your car are manufactured by Brembo and 4 piston. The E63 brakes I believe are 6 piston. I never felt that the existing brakes were inadequate on my 2010 E550 4M. Warping of the rotors is an issue that some seem to experience more than others. I never had a warped or pulsing brake issue on my 2010 E550 and don't experience that issue with my current 2014 E550 4M either. I always used OEM brake parts. My OEM pads for the 2010 E550 were stamped Akebono from the factory. That is a quality pad and I was sure to bed them in properly when doing brake jobs. For the cost of any "upgrade" whether from MB or aftermarket will be in the thousands. You could thrown on new pads and rotors every year for 10 years before you reach the same cost. I'm doing fine for about 10K mi now with the Centric Premium (aka Stop Tech I think) rotors and their ceramic pads. The 2011 may have different parts than my 2012 though. I think I remember the front calipers looking different. If so, maybe a 2012 + E550 swap would be affordable from a junker. Do your front calipers look like this? Flat silver face with logo? Nope, mine look different. I think those were for the face lift model of the W212. Here is a picture of what mine look like. This is not a race car, so I'm not expecting increase performance. However, I feel the stock units are inadequate for the car. The fact that the brakes were changed after 2012 leads me to believe this is the case. Having said that, I do realize the cost of the rotors are insane for the CL63. The calipers are pretty reasonable because I don't think anyone is doing this conversion. I have the StopTech with ceramic pads on there now. They were better than stock, but same issue. Yes, I believe the 2012-2014 have different brakes. I'm not sure they are compatible, but if they were that could be an option for me. I think upgrading to the 2012 brakes in the front would be a good option, and not too expensive. I see the calipers about $100 or so each used. The rotors are 360mm vs. 344mm for the 2011 model. Maybe the calipers are a direct bolt-on. I'm looking at the mounting bolt pattern in pictures and it looks like it could be the same. I would probably spend some time studying part diagrams between the two years though. Thanks. The rotor should bolt right up. I'm just not sure if the spindles were different where the calipers might not bolt right up. In any case, I agree, it might be the simplest way to go. It looks like I can also use the C63 front rotors, which have the same spec, but are a lighter 2-piece design (although more expensive). The AMG 2-piece rotors are stupid expensive, one reason why I didn't go for the E63. Rotors are a grand a pop, and only available from MB. I talked to a guy who was leasing a E63, and he was due for brakes, dealer wanted $4K for brakes all around, so he turned it in a little early! E550 rotors are the same physical size as E63, at least on the 2012. Yes, you are correct. I was actually talking about the C63 rotors (360mm), not E63 (389mm). The 360mm rotor is available from Zimmerman for about $125 each, and the 2 piece is just shy of $400 each. Thanks for your help I'll see if I can get some used calipers for a decent price and try this out. Double check your brake master cylinder for compatibility. They may be the exact spec, but you never know. Bigger brakes, more force. Mine even look cruddier than this ... I wonder why they did not give them a better finish. Something that would not rust.